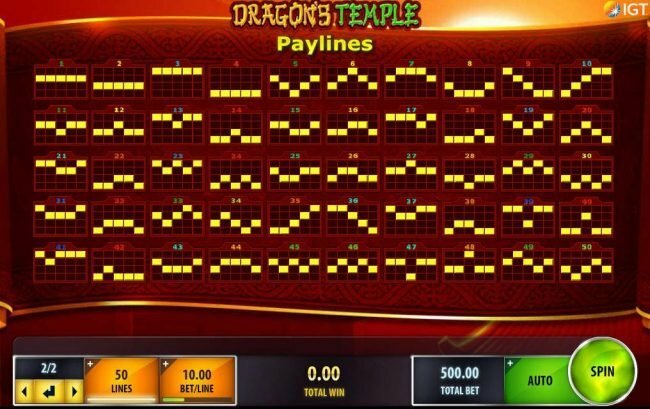 Dragon's Temple Slots has not been reviewed yet, be the first to rate this slot. 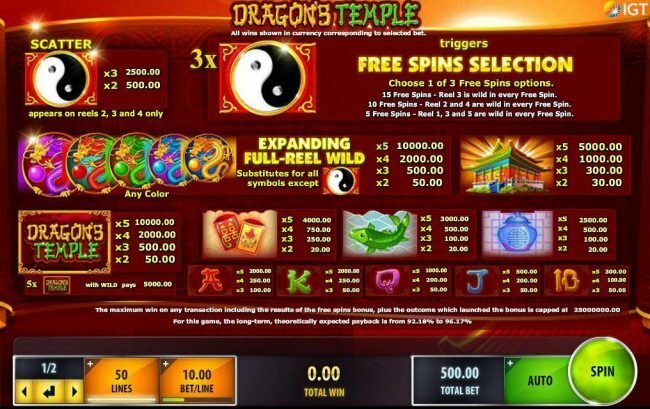 Dragon’s Temple is a 5 reel, 50 payline video Slot crafted by IGT. This game takes place in a time period lost to the history of Japan where Feudal warlords and Samurai ruled over the land. 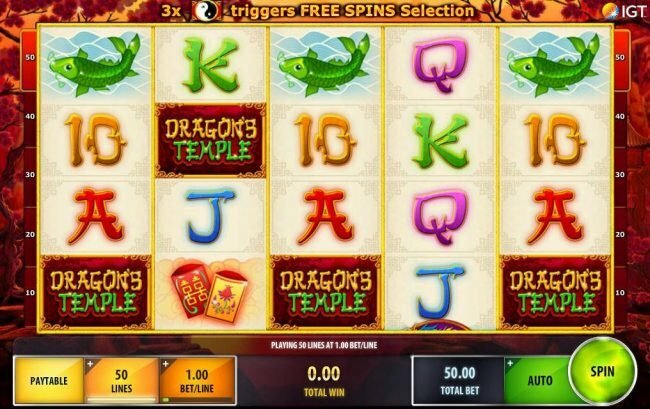 Punters must fend off against a dragon to reveal Free Spins, scatters, wilds and expanding wilds. The grand prize to this game is a jackpot valued at $25,000,000.00. This game’s visual prowess is beyond that of most Slots crafted by this developer. The background sends players deep into the mountains where dozens of mountains & their steep cliffs may be seen. The sun sets down onto two Sakura trees & the temple itself, creating a beautiful landscape in the process. When the reels spin for the first time, they’ll expand over the background, giving punters full view of their spin. 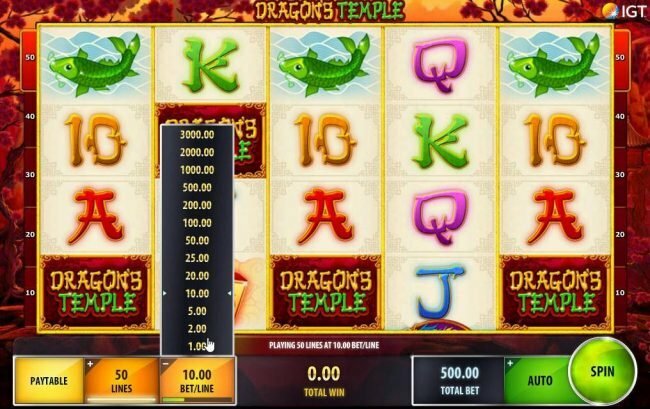 There will be a purple dragon, red dragon, green dragon, blue dragon, yellow dragon, a yin-yang icon, a temple, fishes, jars, old mystical cards and themed poker suits displayed as slot symbols. This game gives punters two different options where placing a bet. The first option granted allows for paylines to be increased or decreased by intervals of ten. The second option has punters alter the value of their stake bets which begin at $0.01 and end at $3.00. By using these two different options bets can be increased to the maximum of $150.00. All of the colored dragons can become an expanding wild. In order for this to occur one of the colored dragons must be displayed on top or below a wild game logo. This, in turn, will have the regular wild turned into an expanding wild and when this occurs, all standard symbols will be substituted. This occurs regardless of which wild is active with the only difference being the regular wild & the expanding wild is that the reels respin once with the expanding wild. Free games are awarded via the Yin Yang icon. This symbol must be seen on the second, third and fifth reels at the same time in order for the free games to be activated. When this occurs punters will be granted with three options. The first being fifteen free games with the third reel being wild, ten free games where the second and fourth reels are active. Finally, the third options have punters given five free games with the first, third & firth reels being wild. This feature can cause for higher payouts than expected. 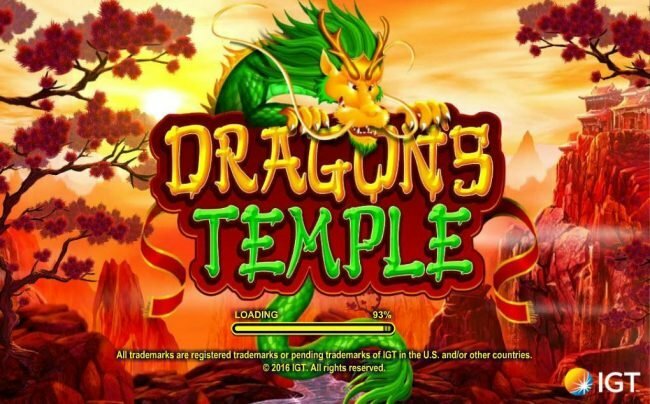 Dragon’s Temple, it’s a game that provides more than most games. The features are designed in a manner that benefits the player. The theme & gameplay work together in a way that causes for a great time to be had by all.